Today's guest is Kevin McNamee, author of a large number of childrens' books, including, most recently, The Soggy Town of Hilltop, and the Amazon listed If I Could Be Anything. Kevin has dropped by to have a chat with us, and share his books. Outside of writing, I would say that I’m the most passionate about my family. If you weren’t a writer, what would you be doing with your life? Right now, I still have a day job. Unfortunately, writing hasn’t been my means to self-sufficiency yet. I’m still trying to find that balance between work/family/writing/everything else. It’s a challenging juggling act, but so far, I’ve been able to keep all the balls in the air. Can you describe the time you realized you were indeed a “real” writer? Somewhere along the way, I stopped doubting my ability. A rejection of my manuscript ceased to be a rejection of myself. A rejection letter became an opportunity to send my manuscript somewhere else. Comments and criticism became opportunities to strengthen my story, revise something unworkable, or something to ignore altogether if it didn’t fit with my vision of the story. I was able to refer to myself as a writer without feeling self conscious and … oh yeah, someone was willing to pay me for what I wrote. What is going on with your writing these days? Right now, I have several stories in various stages of completion, one story that has been finalized and critiqued and needs a final revision, and a few that are finished and have been sent out to various publishers. What are your future goals for your writing? I’ve been focusing primarily on picture books and I would like to branch out to middle readers and Young Adult novels. I have two middle readers in various stages of completion. Describe a typical writing day for you? There’s no such thing as a typical writing day for me. I try to do something writing related every day. But what I’m doing may vary. Sometimes I’m writing new material, sometimes I’m revising, sometimes I’m critiquing, sometimes I’m researching, sometimes I’m promoting. Due to the demands on my time, I’ve needed to adopt the philosophy of doing what I can, when I can. Why do you write? I first started writing in the second grade. I wrote a poem that was displayed outside the classroom and I liked seeing my poem and my name in public like that. I found that I took to writing naturally. Growing up, I was a constant daydreamer and would construct stories in my head all the time. Eventually, I started writing them down. Throughout my teenage years and throughout adulthood I always felt compelled to write. Although there were many, many times that I put creative writing on the back burner, I found that I was still writing at my day job; memos, procedures, proposals, requests, and I was receiving recognition for it. I realized that writing had been a constant in my life, but I wasn’t writing what I wanted to write. Now I make sure that I write what I want as well. or show off my teeth like a cranky old croc?" Beautiful washy watercolours with lots of fun detail from toothpaste tubes to babies in strollers works perfectly with the text, drawing in the eye and encouraging children to think of their own images and wishes. Overall, the book presents a positive message, encouraging children to enjoy the pleasures of the imagination while liking who they are, right now. This is a lovely, well-designed book that children of all ages will enjoy. Older siblings will particularly like reading the book to younger ones, and emerging readers will be able to read it themselves. magdalenaball: Hi Gary, I'm here, and ready to roll. Shoot a question at me and I'll answer as best as I can. magdalenaball: I'm Magdalena, writer, reviewer, mother, juggler. Author of Repulsion Thrust (poetry), Sleep Before Evening (fiction), and more. magdalenaball: I'll talk Repulsion Thrust (latest). It's science inspired poetry: seeking answers to the human condition through Quantum Physics. magdalenaball: what I will say is that I think poetry can often bridge the communication gulf. Getting from what I mean to what you hear is hard, and metaphor (cheating I know) can bridge that gulf instantly - like music, or visual art. magdalenaball: and I believe that communication (EM Forster's 'Only Connect') is at the heart of improving the 'human condition'. How's that? magdalenaball: I think most therapy works through naming and identifying the source of pain, and poetry can do that without over simplifying. magdalenaball: being a poet I don't take well to the usual affirmations, but it definitely helps to find words, even if those words are metaphors. magdalenaball: Happiness, joy, prosperity are all relative words. They're meaningless without a personal context - otherwise there's never enough. qlcoach Excellent point. I believe there are many access points to the creative Light within. G.
magdalenaball: Yes. My novel Sleep Before Evening was a portrait of why a creative life is critical and the impact of stifling creativity. magdalenaball: Tell me about The Eby Way. How did you go from coaching to book and back? qlcoach Thanks for that question.The Eby Way, is a self-help guide to overcoming past dark secrets so we can achieve our goals today. qlcoach You can also learn four simple steps to a more positive life. magdalenaball: tell me about the self-help process. Is it something novel/new? Or do you combine a range of approaches? What does it solve? qlcoach The Eby Way: face stressful feelings; use positive thoughts; take positive action; turn to positive power. G.
qlcoach People can find out more about my work and watch The Eby Way Video: http://www.ipodiums.com/qlcoach G.
magdalenaball: http://www.magdalenaball.com for samples and more information. Anything else you want to add? qlcoach Here’s the real secret: as long as your heart or mind or body remembers that negative incident long ago, change will be hard. qlcoach What do you think about our Twitter interview process? magdalenaball: Interesting. I'm not normally succinct, so good discipline. Fun, and relatively easy/intuitive. Will post a transcript on the blog. qlcoach Excellent. Thanks. I'll go and check it out. I'll also post a transcript of this interview on my blog as well. Any final thoughts or comments? G.
magdalenaball: Just a big thank you for taking the time to chat with me. I'm sure we'll talk again. Best wishes with everything. qlcoach The same to you! Please stay in touch. And here's to VBT too! Peace and Light....Gary. Award-winning poets Carolyn Howard-Johnson and Magdalena Ball have never met. In fact they live on different continents. But that hasn't stopped them from collaborating on a series of poetry chapbooks designed to replace trite greeting cards with real sentiment. With their 'celebration series', the two have developed a new concept for inexpensive holiday gifts. Their chapbooks of poetry include Cherished Pulse (for anyone you love) with artwork from California artist Vicki Thomas, and She Wore Emerald Then (for mothers on your gift list) with photographs by May Lattanzio. A new booklet titled Imagining the future will be released over the next few weeks in time for Father's Day 2010, with further books for women everywhere, and there is a Christmas chapbook in the works. The small books, a tradition in the poetry world since Elizabethan times, are priced to compete with greeting cards and provide real poems, designed, for the same price as a high end card, to go far beyond the cliché sentiments in most greeting cards. 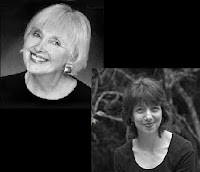 Now both of these poets' collaborations, Cherished Pulse, and She Wore Emerald Then, have been released on the high profile Smashwords.com site, and can be read in over nine digital formats on any computer or portable reading device anywhere in the world. Smashwords unique technology allows the work to be available into every format used by the millions of new e-book readers that are flooding the market. Even as the hardware and software change, the author's words will remain available to readers. This is quite a revolution for both authors, both of whom started their writing careers when the latest technology was a typewriter and carbon paper for copies. Magdalena Ball runs the highly respected compulsivereader.com review site. She is the author of the poetry book Repulsion Thrust, which was published in December 2009 to unanimous 5-star reviews. Her novel Sleep Before Evening, published in 2007, was a Next Generation Indie Book Awards Finalist. Carolyn Howard-Johnson's poetry appears frequently in review journals. She is listed in Poets & Writers and her chapbook of poetry, Tracings (www.budurl.com/CarolynsTracings), was given the Award of Excellence by the Military Writers Society of America. She is also an award-winning novelist and short story writer and instructor for UCLA Extension Writers' Program. For more information on any of the chapbooks in this poetry series, contact either of the authors or visit media rooms at www.howtodoitfrugally.com or www.magdalenaball.com. The Tangled Bank: Love, Wonder, and Evolution is now available for purchase. The anthology, which marks the 150th anniversary of Origin of Species, features over 100,000 words of speculative fiction, poetry, artwork, and essays about evolution. An international line up of nearly 50 contributors includes Sean Williams, Brian Stableford, Patricia Russo, and Carlos Hernandez. The collection includes one of my poems "Expression of the Emotions," which was inspired by Darwin's lesser known book The Expression of the Emotions in Man and Animals. The book's editor has make one of the stories available for free: “Darwin’s Daughter” is a darkly beautiful tale from 2009 Aurealis Award winner Christopher Green. According to a recent Reuters poll, the tough economy has caused US. consumers to cut back on all sorts of indulgences, including holidays, dining out, going to the movies and shopping sprees. Books, however, are not seen as an indulgence, but rather the kind of 'must-have' simple pleasures that is more relevant than ever to consumers. The survey, conducted on the 29th of Jan, polled 3,000 people on how they spent their money.